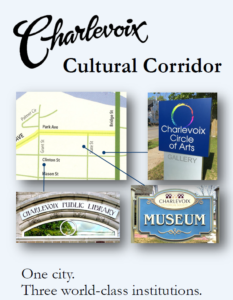 Charlevoix’s premier arts and educational district is compised of three world class institutaions, all conveniently located in the heart of the downtown district. They include the Charlevoix Public Library, the Charlevoix Circle of Arts and the Charlevoix Historical District. The library connects people to resources that educate, enrich and empower. We offer books and other lending materials, lectures that educate and enlighten, and activities that promote literacy. Cultural offerings include ongoing art exhibits, historical collections and concerts. A group dedicated to the protection and preservation of Charlevoix’s history. Charlevoix Area Garden Club meets on the 2nd Tuesday of each month at 1 pm at the Charlevoix Public Library. The Charlevoix Circle of Arts is a nonprofit organization with the mission to promote Charlevoix as a cultural arts hub by providing community enrichment and support of the arts. Charlevoix County History Preservation Society have monthly programs, check web site for details. Charlevoix Evening Garden Club meets the 2nd Tuesday of each month at 7 pm at the Sunnybank Retirement Community, Charlevoix. Charlevoix Kiwanis meets every Tuesday from 12:10 pm – 1:10 pm in the lower level of the Weathervane Restaurant, Charlevoix. Charlevoix Knights of Columbus meets on the 2nd Thursday of each month at Charlevoix St. Mary’s Church Family Center at 7pm. Charlevoix Lions meets most Mondays at noon in the lower level of Weathervane Restaurant, Charlevoix. Charlevoix Rotary meets every Thursday at 7:30am at the Flap Jack restaurant, Charlevoix. Charlevoix Street Legends meet on the last Thursday of each month at the Charlevoix Senior Center. Potluck at 6:30, meeting at 7pm. Charlevoix Zonta meets on the 2nd and 4th Wednesday of each month at the Grey Gables resturant in Charlevoix at 11:45 am. Snowmobiling, Hot Air Balloons, Parasailing, Boat Charter & Rental, etc. Please email us if you have a link to submit, but we reserve the right to choose NOT to include it if we feel it is inappropriate for this site for ANY reason.